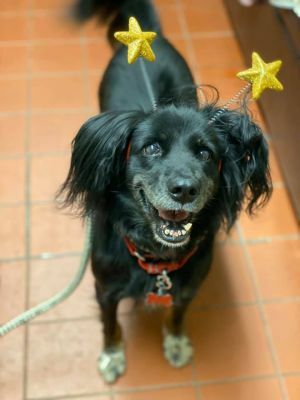 Hi my name is Jessica (aka Jessie) and I am a sweet 8-year-old female Border Collie/Cocker spaniel mix weighing 40 pounds with an awesome black fur coat that doesn’t shed . After being rescued from the illegal dog meat trade in Thailand in 2016 I was brought to Posh Pets. The people here are great and I have adjusted pretty well, however I would love to find that forever couch I can call my own. At the first meet I may be a bit scared and defensive with you and I may show an ugly side that I am not proud of, but once we get to know each other you will see that I am really a sweetheart. I need that special someone that can give me their time to help me overcome my fears. My foster mom understood me, and I loved it when she rubbed my belly till I fell asleep on her bed (did I mention I don’t shed). She also took me in the car when she was running errands around town ( I do love a good car ride). I never beg for food and when it’s time for walks I do one wicked happy dance! Another way I like to pass my time is playing with my chew toy and chasing balls. I also have a BFF Boxer Pittie mix who is an alumnus of Posh Pets and lives nearby, when I was at the foster home we would take long walks together and play in his backyard. I am housetrained, easy on a leash, hardly ever bark and spayed with all my shots. I hope you can find a place in your home and your heart for me, you won’t regret it!